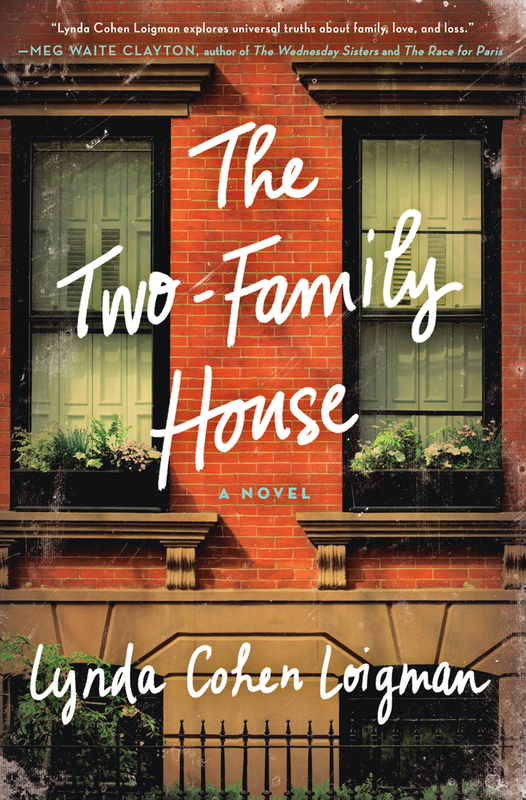 THE TWO-FAMILY HOUSE by Lynda Cohen Loigman is a special novel about the lives of two families who share a house in Brooklyn. It's an insightful look at what happens when a major decision is made in a matter of seconds and how that split second decision can alter the course of both families' lives. THE TWO-FAMILY HOUSE tells the story of brothers Mort and Abe and their families. Mort and Abe work together and live together in a two-family house, so needless to say, their lives are very intertwined. Mort is married to Rose and they already have three daughters... which is a major disappointment -- he desperately wants a son and tends to take out his anger on his family. Meanwhile, Abe is married to Helen and they have four boys. Abe is much more content than his brother both at home and at work; however, Helen is some times overwhelmed with all of the testosterone in their house. When Rose and Helen both find themselves pregnant at the same time, they set their hopes high that they can deliver the a boy and girl respectively. However, when they both go into labor on the same snowy night, when their husbands just happen to be out of town, they make a decision that will forever change everyone's lives. I enjoyed THE TWO-FAMILY HOUSE! I tend to love books about the complexities of family dynamics; and, therefore, I thought the premise of the story was fantastic. This book had so much potential, and for the most part, it delivered. However, there was something missing that I can't quite put my finger on. If I had to make a guess, I'd say that the character development was a little lacking. There were times when the characters were just a little too predictable and/or stereotypical. As I mentioned earlier, I thought the plot of THE TWO-FAMILY HOUSE was excellent! I'm sure you have figured out what these two women do -- it's not really a secret from the very first pages of the novel; however, the dynamics of having them share a house was a great twist. I really enjoyed seeing how these women interacted before they had their babies as well as how they dealt with the aftereffects. Both women were very different and they definitely had very different capabilities in handling the situation. I especially appreciated how the author showed the decline in Rose's mental state. In addition, I thought the portrayal of Mort and Abe was very interesting. Mort was an odd duck and more than a little hard to take for much of the novel. I appreciated what the author tried to do with his character, but it fell a little flat to me. His behavior at the beginning of the novel was almost unbelievable to me, and I really wasn't able to relate to his situation at all. What I did enjoy seeing, though, was how Mort eventually evolved into a better man throughout the course of the novel. I thought the real strength of this novel was in how the author chose to tell the story. She used a variety of characters, namely Rose and Helen and their husbands, but she also used two of the daughters. Rose and Mort's eldest daughter, Judith, was at an impressionable age when the babies were born; and eventually she figured out everything. Her story about dealing with her difficult father and coming to terms with what her mother did are touching and heartfelt. In addition, I enjoyed learning Helen and Abe's youngest child, Natalie's, story. I don't want to give too much away, but Natalie's story has a neat little twist that I appreciated. THE TWO-FAMILY HOUSE would make a terrific book club selection. Unfortunately, I wasn't able to find a discussion guide, but I don't think your group would really need one. Some of the themes you might want to explore include marriage, friendship, family, secrets, betrayal, loss, grief, identity, and parent/child relationships. Overall, I really liked THE TWO-FAMILY HOUSE and I think fans of literary novels who appreciate family sagas will too! Oh yes, I'm pretty sure I know what they do but what a great plot! I'm pretty sure I know what they do, too! But I still think this is something I want to read. I just added it to my list! Oh wow. Sounds very interesting! I'll check it out.